This is it! The answer to your summertime question of "What are we going to do today?" 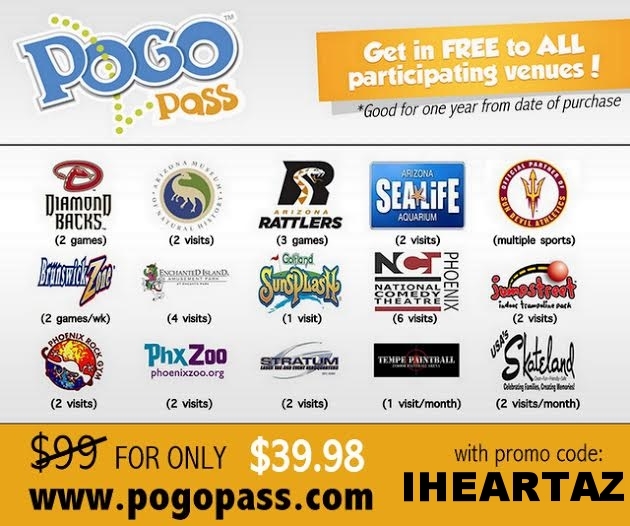 Check out all that the Pogo Pass includes: Sunsplash, Diamondbacks, Phoenix Zoo, Jumpstreet, and tons more. Use the promo code IHEARTAZ to get 60% off! Instead of the regular price of $99, for only $39.98 per person you get a year of fun. The Pogo Pass is likely the best deal in the Valley. We bought some Pogo Passes as a wedding gift recently for my sister and her new husband. Now they have a year's worth of FREE dates! The passes are also perfect for teenagers or families of all sizes. Buy them for yourself or buy them as a gift. Right now there is no end date for the code.